I'm not really into AC style characters, but I'm still eager to see how it turns out. I made an altered version of your model with a head from another (ripped) model. I even found a way to make the eyes to blink correctly. It would help if you would use for the eyes another texture. Because the Npc's use the same textures for closed eyes. I'd like to see the trailer Cloud too. 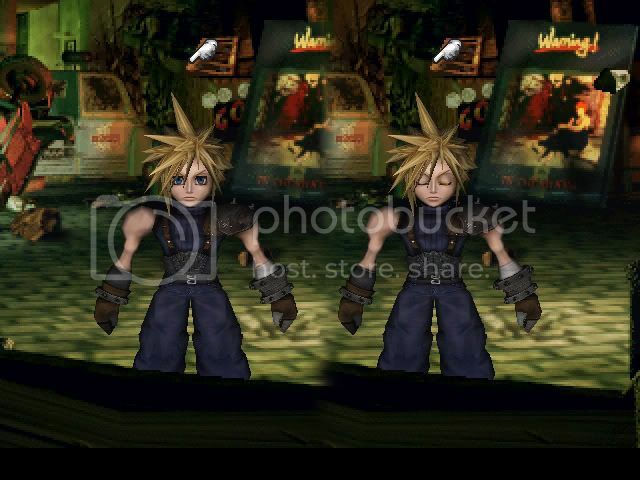 I never finished my first run of FF7, and I'd like to finish the most comprehensive and hires modded version of it that I can before the PS4 release. Nope. I did it a bit different. I use only one mesh instead two where one dissapear and you see the other with the closed eye. My way also supports to close only one eye or change only the mouth. It also looks much better when the model is in blend mode. 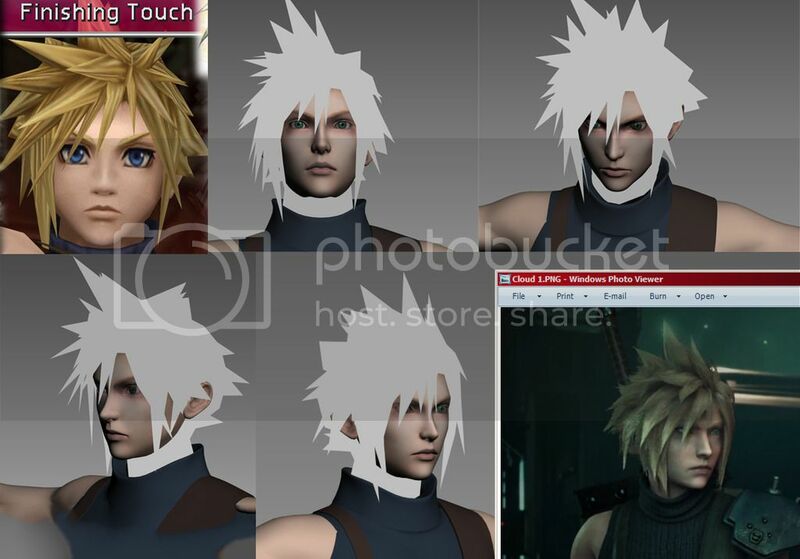 What i die was to seperate the model into four pieces (eye left, eye right, mouth and the rest of the face) and merged them with pCreator (first eye left, then eye right, after that the mouth and at the end the rest). The closed eye texture have I replaced in the flevel.lgp. Word. I might talk to you about that when I get around to doing it. I'm all for simplicity, so we'll see what happens. Holy strawbarries your model looks better as the original. You have made a much better nose. I would say he looks more aggressive. This is reassuringly the most accurate Cloud I've ever made. 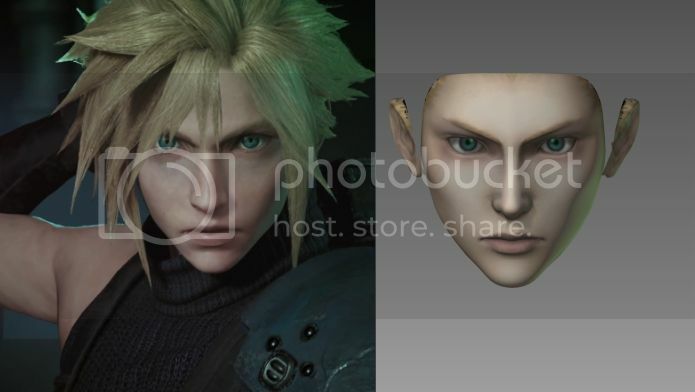 He lines up with this new Remake Cloud (Which has been tweaked) and also still recognizable as the AC Cloud as well as Crisis Core (Even though he had baby-face in that one) The remake Cloud look like me, huge dark circles under his eyes, and cheeks withdrawn. He must be an animator! I love you Apz... Just thought I'd let ya know. It does look good, but the face features are too soft for my taste. The current version you are working with is amazing , but will it have a working model on world map? I'm new here but have been lurking for a couple months. APZ, you do amazing work and I am *REALLY* looking forward to this model!! Super pumped!! Do you accept donations? SPEAKING OF dear Cloudsmash, I do accept donations, but it's been a while, let me get back to you once I've set all that up again.